A Court of Frost and Starligh by Sarah J. Maas is the newest story from the A Court of Thorns and Roses series. 1. Anyone who reads this blog knows I am a huge SJM fan, and this is my favorite series. 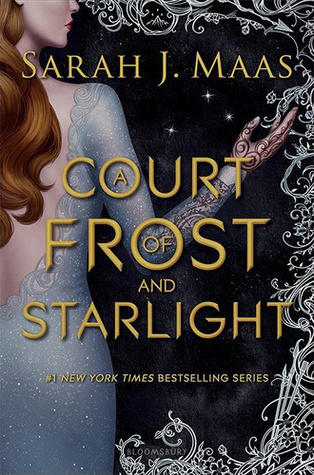 This story, not quite a novel but a little long to be a novella, not only gives a glimpse of our favorite Court of Dreams post Hybern war, but also is setting up for the next part of the series that is going to focus on the Court members other than Feyre and Rhysand. 2. I may have squealed with excitement to see Cassian get his own chapters. I loved getting more of him and his back story about his mom. I love him so much, I named my Bassett Hound after him, and this book proved I named my dog after the right character. There is a section of a chapter were he brings pine boughs and leaves them on the floor of Feyre and Rhys's home, and my dog loves to bring in pine branches to my living room. 3. I love that this story shows just because the war is over does not mean everything is perfect. There are still struggles to deal with, and that people have wounds that still need to heal even if they are not visible. 4. There is so much to love about this story. The start of healing. The hints on the next stories. And more importantly, SJM finally gives us the much promised wall scene, so hot!